Check out this adorable embroidery design from our versatile bunnies collection! This one in particular features a beige bunny struggling with a large pile of colorful presents. Someone’s definitely in for a treat! 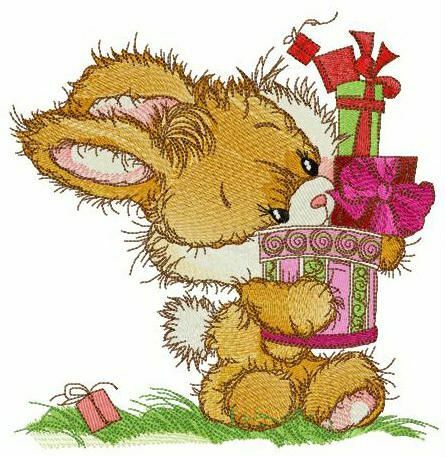 The bunny is hurrying up to unpack the load of gifts wrapped in colorful paper and decorated with ribbons. The little guy even lost a tiny present in a green grass behind. This lovely needlework comes in a mix of nineteen colors including crimson, meadow, yellow, spruce and ruby glint. It’s perfect to decorate any baby stuff like onesies, pajamas, blankets, quilts, napkins, T-shirts, towels, etc.